Join St. Thomas Aquinas and Aquinas Center for a mural paint day to continue the efforts to transform and engage through creative action. All ages are welcome and no previous artistic experience is needed. The painting is done on parachute cloth panels that are easily accessed at table height. The mural panels will then be installed on the St. Thomas Aquinas gymlower hall across the parking lot from Aquinas Center. 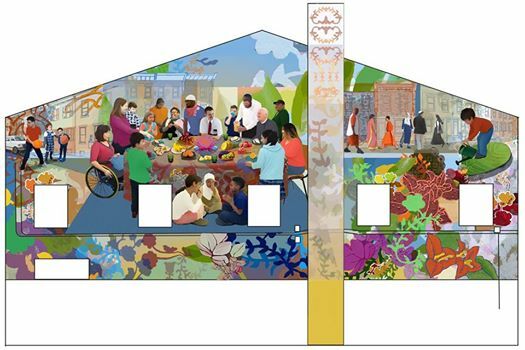 This project was initiated by Interfaith Philadelphia with artistic support by Mural Arts Philadelphia, including the engagement of artists Jared Bader and Rashidah Sala, and financial investment from Radian and Pew Center for Arts and Heritage. Note that the paint day will be held outside in the Aquinas Center courtyard and adjacent parking lot of St. Thomas Aquinas with an onsite space alternative in case of rain alternative.